Note: The new type LED Tube light use SMD 2835 0.2W LED chips.This chip is thinner than 3528 and 3014, so the light efficiency is more uniform.and at the bottom of the chip with heat sink,can heat dissipation better.All in all,LED Tube with SMD 2835 chips is a good choice for you. Unbelievable low-energy consumption. 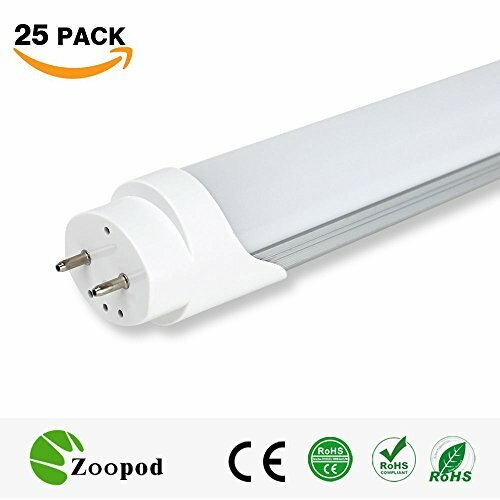 This allows you to save 70% on energy costs alone, thanks to its 120cm T8 led fluorescent tube.It lasts more than 50,000 hours and about 300,000 cycles. Superior quality LED as a light source. It's safe as it's mercury-free,No UV/IR and fits perfectly into a G13 socket. However, it's not dimmable. It comes with a built-in protection against short-circuit and over-temperature. Switching capability is very high. Built-in electronic ballast that comes with a high-power factor. Once switched on, you get instant full brightness. Safer, faster and easier replacement for fluorescent tube. Comes with a 3-year warranty and a wide angle beam. Expect to have above 99% light transmittance. It's also suitable for operations that are at low temperatures. If you have any questions about this product by Zoopod, contact us by completing and submitting the form below. If you are looking for a specif part number, please include it with your message.